This locomotive was built at the Robert Stephenson & Hawthorns Works, Darlington and entered traffic on the 15th October 1960, allocated to Crewe North shed. Two months later she was transferred to Liverpool Edge Hill, where she remained until March 1964 before being re-allocated back to Crewe North. November of that year saw her move South to Willesden, a move which was only to last three months, before she found herself back at Crewe North. During April 1966, the loco was re-allocated to the London Midland Region Western Lines. June 1968 saw her allocated to D01 London Division, however a month later she was transferred to D08 Liverpool Division. In November 1968, the loco moved to D05 Stoke-on-Trent Division and remained there until February 1970, when she was moved back to the Manchester Area allocated to D09. The loco final depot was Longsight in Manchester which she was allocated to from May 1973 until being withdrawn from traffic in 1983. Under the new TOPS number system, D306 was renumbered to 40106, this change taking place at her own depot of Longsight in March 1974. During June 1976 the loco was placed into store at Longsight depot, however by August of that year she was back in traffic again. From the first day D306 entered traffic the loco had only appeared in green livery, somehow she had managed to avoid the new BR blue livery, but during July 1978 all that was about to change, as 40106 was called into Crewe Locomotive Works, for what was to be her final General overhaul. However, to every one's delight 40106 was released back into traffic on the 7th October 1978 in Brunswick green livery with full yellow ends and numbered 40106. From then onwards the loco was a big success with enthusiasts, appearing on a wide variety of rail tours and special workings. In May 1980, the loco was chosen to represent the class at the “Rocker 150 " celebrations which was held at Rain hill. During 1981 - 1982 the loco was a regular performer along the North Wales Coastal route and was still enjoying her role on Railtour and special excursions. However, being a vacuum braked only locomotive meant her days in traffic were numbered and on the 12th March 1983 the loco was stopped at Wigan Springs Branch awaiting a decision on its future. Two days later she was moved to Crewe Diesel depot but still on decision regarding her future. With D200 -40122 now being re-instated to traffic 40106 was officially withdrawn from traffic at Crewe Diesel depot at 08:00 hours on 21st April 1983, just three days before D200-40122 was officially re-instated. Despite being officially withdrawn from traffic, the loco was cleaned up and sent to Wrexham in October 1983, for a rail exhibition. After the event the loco returned to Crewe depot. During the late part of 1983, tender forms were sent out for the sale of two class 40's, namely 40106 and 40145. Mr.Gerald Boden successfully tendered for 40106 and the Class 40 Preservation Society secured 40145. On the 16th April 1984, the loco was moved from Crewe Diesel depot to Loughborough yard and two days later transported by road to the Great Central Railway. The loco was quickly restored and became the first preserved class 40 to work in preservation. On the 9th August 1984, D306 was named “Atlantic Conveyor “by Mr. John Brocklehurst, Chief Officer of the Atlantic Conveyor Container Ship, which was so tragically lost in the Falklands conflict. In true Class style, the nameplates were cast and where identical in every way to those originally fitted to the class. On the 12th August 1984, the loco made its first public run in preservation and became the first preserved member of the class to run on a private preserved railway. During October 1987, D306 was disguised as the famous D326 being fitted with mock-up split headcode boxes displaying the train reporting number 1M44 for the filming of “Buster ". The filming took part at the Great Central Railway and after the loco was returned back to her original appearance. On the 21st February 1990, the loco finally left the Great Central Railway and moved to a new home at the Nene Valley Railway. The journey was by road travelling from Loughborough via the A6 to Leicester and then the A47 to Wansford. With the loco now based at a preserved railway with main line connections, she will be able to venture out to other preserved railways and open day events. In fact the loco as already visited Coalville, Kings Lynn, Doncaster Works and Ruislip depot on the London Underground. The locomotive works regularly on the Nene Valley Railway during the summer months on a variety of duties. On Wednesday 11 May 2011, 40106 moved from the Nene Valley Railway to Washwood Heath being drag by green livery 31190. . This was also 40106’s first trip out on mainline metals since the early 1990s. It travelled to the Coalville open day in June 1990: Cambridge, Kings Lynn, Ruislip and finally Doncaster open day in 1992. The loco received a full repaint into Dark Brunswick Green at Washwood Heath Met Cammel Work by Boden Rail engineering Ltd.
D306 now ex-works all over green livery visited the Severn Valley Railway Autumn Diesel Gala on 6th – 8th October 2011. The following April the locomotive attended the Great Central Railway (Nottingham) diesel gala on 27 – 28 April 2012. Next was the turn of the North Norfolk Railway when D306 visited the railway’s summer diesel gala on 13th – 14th June 2014. Later that year, now numbered 40106 in green livery with full yellow ends, the loco attended the Severn Valley Railway Autumn Diesel Gala which was held on 2nd – 4th October 2014. 40106 first trip north into Scotland since being preserved took place in July 2015 when the loco attended the Bo’ness railway summer diesel gala over the weekend of 26th & 27th July 2015. In 2015 after a lot of rumors and speculation, 40106 was put up for sale by its owner Mr. Neil Boden and sold to the Class forty Preservation Society. ​The loco is now based at the East Lancs Railway in full running order and fitted with a fully operational steam heat boiler. 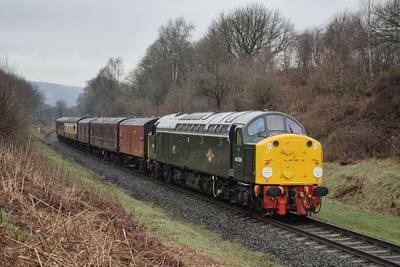 ​40106 Appeared at the ELR Class 40's 60th Anniversary Event held on 13th to 15th April 2018 with class mates D200, 40012, D213, 40135 and 40145. 04:66 LMWL (London Midland Western Lines). Officially withdrawn from BR operating stock at 08:00 hours on 21st April 1983. Owner by: - The Class 40 Preservation Society (CFPS). Based at: - The East Lancs Railway, Bury, Lancs. Current Livery: - Dark Brunswick Green with full yellow ends. Dark Brunswick Green with full yellow ends.